Sherman Oyler was a member of Service Company, 508th when he was transferred to the 541st PIR on Special Duty He apparently was subsequently transferred to the 502nd PIR. His fervor as a history teacher came directly from his personal experiences in the ETO. World War II took on a special meaning for eight grade history students at Jardine Junior High School this morning as their instructor, Sherman Oyler, relived his military days by demonstrating proper parachuting techniques. 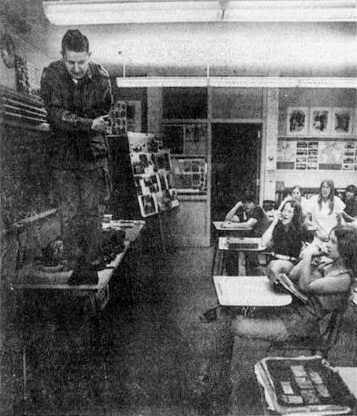 Oyler's annual jump off the desk is the highlight of the study of war and comes after he has put photographs, military patches, uniforms and hardware throughout his classroom. Students in Sherman Oyler's eight grade American history classes experienced D-Day plus 30 today. Oyler, who parachuted into the French Normandy countryside nearly 30 years ago has given his students at Jardine Junior High School [Topeka, KS] a "You Are There" portrait of the Allied forces landing in World War II for each of the last 16 years. "I yell them what personally happened to me ... what I saw, what I experienced and what I smelled," Oyler said. A complete explanation of War 2, as he calls it, would take a whole course, Oyler said. Therefore with this war as well as other major events, he tries to use a few vivid examples of history to win student interest. Oyler's D-Day re-enactment includes classroom walls covered with photographs, patches and medals collected from his war days. He wears his uniform. displays food ration cans and lets students examine other military hardware. "It's a combination of showmanship and story-telling," he said. "Once they get a little information about War 2, they can see it was a struggle for survival." Oyler was a Staff Sergeant in the 2nd Battalion, 502nd Parachute Infantry Regiment, 101st Airborne Division, ad landed in a French pasture on D-Day. Among the D-Day highlights, Oyler tells about, is meeting Gen. Dwight Eisenhower before leaving in a C-47 transport. "Eisenhower wanted to meet some soldiers from Kansas so the shoved me and another man from Wichita to meet him. " Oyler said. He admitted he was nervous and almost forgot his name. On another incident, Oyler jumped into a ditch to avoid mortar fire after a parachute landing in Holland. He tumbled on top of CBS Walter Cronkite, then a war correspondent. Hanging on to a portable typewrite and with patches on each shoulder saying "war correspondent," he (Cronkite) said some things that you couldn't air on television, Oyler said. Oyler and two other soldiers in the ditch simply could not understand why anyone would be there that did not have to be, Oyler said. Years later Oyler wrote to Cronkite asking if he remembered the incident. Cronkite replied he remembered the ditch although he didn't remember the names of the soldiers, Oyler said. Oyler said he "telescopes" other battles to represent action in other wars. For example he uses the battle of Gettysburg to help students study the Civil War. He provides them with the personal experiences of soldiers who wrote about the battle.